There’s been so much talk about the Digital Super 8 cartridge, such as the one conceptualized by Nolab (Hayes Urban) but it never came to a working product. So after having read many comments and requests from Super8 enthusiasts who simply want to combine the flexibility of Digital with the creativity of real filming using a Super8 camera, in 2015 we decided to make it happen! (not knowing then that it would take us 3 years to have a working prototype containing all components, controllable via an app on your smartphone). The above footage was shot with the Digital Super 8 Cartridge prototype inside a Nizo 481 macro super8 film camera. Shot in 12 bit RAW, 18fps and at 720p resolution. Colorgraded and rendered through the software that comes with the cartridge. The Digital Super 8 cartridge shoots 720p at 18fp at 12 bit RAW. And there are many more shooting modes. Our working prototype fits right into your old super8 camera with just 2 minor adaptations to the camera itself. Forget about having to buy super 8 film, sending it in the mail and having it developed. Do away with expensive digital scanning of your developed films. The digital super 8 cartridge lets you shoot super 8 to RAW digital images and renders it to video directly! You simply load it and you can shoot digital super 8 film. And things are getting even better. We’ve further pushed the performance of the Digital Super 8 cartridge so it now also shoots HD 720p as well as 21:9 (1280x540p) in 12 bit RAW!. Also we added optional HDR processing and we’ve ported the cartridge to the more cost effective NanoPi Neo Air platform. For example footage see black bird and 720p example and this 12 bit 21:9 (1280 x 540) example. Key in our design is the shutter synchronization circuit that senses the passing of the film claw in the super 8 camera and triggers the capture of each single digital image accordingly. This circuit ensures that timing of the digital image sensor is perfectly synched with the super 8 camera shutter. Providing that Super 8 image quality and look & feel. No ‘wobbling’ video like with digital video cameras but that true ‘stuttering’ experience. The core of the Digital Super8 cartridge is the only one subminiature USB camera available in the world that fits the super 8 cartridge form factor. 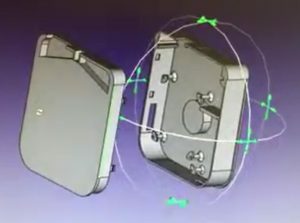 We designed a new super 8 cartridge that can be 3D printed and it contains all the parts: the CMOS sensor subminiature camera, the NanoPi Neo Air single board computer, the lithium polymer chargeable battery and charging ciruits and our own designed shutter sync circuit. In order to control the Digital Super 8 cartride once you have placed it into your super 8 camera we developed the Digital Super 8 App. 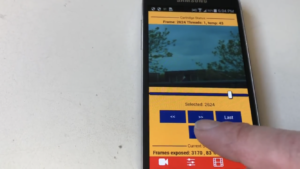 The app enables you to control all settings for shooting, and it provides viewing of the digital super 8 images and film you captured. Also there are monitoring features that can be used when filming. Exporting the RAW images as individual files to USB stick provides the opportunity to then process and render video files on any computer (Linux version only at the moment). 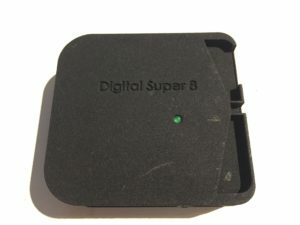 The Digital Super 8 app runs on iPhone, iPad and Android devices and it connects to the cartridge via WiFi. The cartridge runs its own Wireless LAN access point for that purpose. With the Digital Super 8 cartridge and the Digital Super 8 app on your preferred device you are provided with a solution that enables you to shoot 8 bit or 12 bit RAW images. Our own developed control and image processing software lets you control various shooting modes, colorgrading and rendering of the RAW images into uncompressed or compressed video files. You can shoot 24 fps or 18 fps at 640 x 480 at 12 bit RAW resolution. Or 720p in 18 fps at 8 bit or 12 bit RAW resolution. The software also provides scene dissolves and lets you set modes for 6 fps full HD, single frame (HD or full sensor 5MP) or timelapse, all at 8 or 12 bit RAW. There is one modification that you will have to make to your super 8 camera for it to work with the Digital Super 8 cartridge which is that the filmgate needs to be removed (unscrewing 2 screws). ALso not all super 8 cameras will be able to handle the Digital Super 8 cartridge, even with the film gate removed. We have now done extensive testing with the first working prototype and Digital Super 8 has now become reality. The current Digital Super 8 cartridge is not a commercially viable product but a project and prototype to demonstrate the potential of the concept. The current prototype does not fit just any super 8 camera. It has been developed to fit Braun Nizo models.